The Farallon Islands within the Greater Farallones National Marine Sanctuary are home to some of the world’s largest great white sharks. These islands (Southeast Farallon and Maintop Island) off the coast of San Francisco are the winter water playground of adult great white sharks measuring 15 to 20 feet long. (4.5 meters to 6.1 meters). The sharks come to the Farrallones to dine on the local population of Northern Elephant Seals. Trips depart before dawn from San Francisco’s Pier 40, next to the home of the San Francisco Giants, and conclude no later than 6 pm. The price includes breakfast and lunch on the boat. 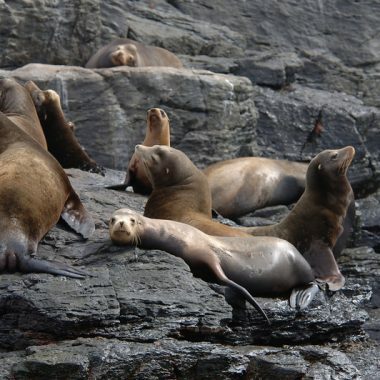 On the way to the Farallones, participants learn about the Greater Farallones National Marine Sanctuary, the Farallon Islands, white sharks and other local wildlife, from a trained naturalist. The 65 ft Derek M Baylis, a custom-built offshore research and education vessel, can comfortably accommodate 12 cage divers and 4 topside observers. Viewing Season: The official season is from September 15th until November 30th. Cost: $825 for cage divers / $475 for topside observers. Call for custom group or private charter pricing. Participant Requirements: No dive experience required. Participants should be in reasonably good health and comfortable in the water. Minimum age requirement may apply for cage divers. Trip Notes: Trips are conducted according to the terms of an educational permit issued by the Greater Farallones National Marine Sanctuary. A floating shark cage and surface-supplied air is used. 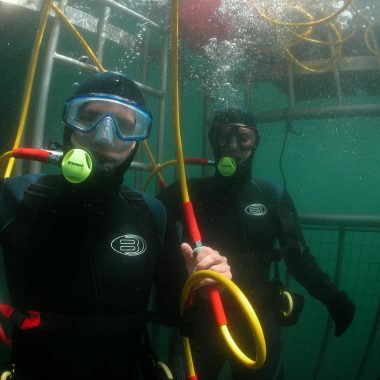 Shark divers are supplied with a wetsuit, hood, boots and gloves. All participants are required to purchase dive insurance and sign a release of liability. There is no shark guarantee. If you do not see sharks, there is no refund. We’ll take you to the best spots and do everything we can to insure sightings, but we cannot control nature. 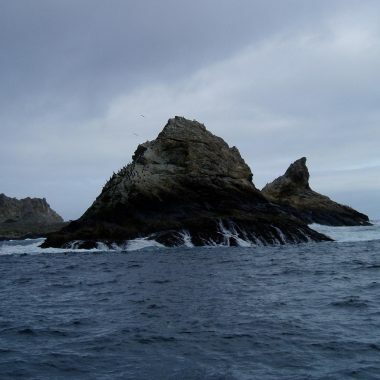 The Farallon Islands are part of the Gulf of the Farallones National Marine Sanctuary. Sanctuary regulations enacted in 2009 prohibit the attraction of white sharks without a permit from NOAA. In 2009, Incredible Adventures was granted a permit to actively attract white sharks by using a mammal-shaped decoy. Incredible Adventures does not chum for white sharks or interfere in a white shark’s natural behavior in any way. Viewing these giant creatures is a sight unlike any other. The Farallon Islands are a brutal place, where the seas can be rough and the weather miserable. That’s part of what makes viewing great white sharks off the coast of San Francisco an incredible adventure! Peak shark sighting season at the Farallones is from late September through mid-November. Call 800-644-7382 to book your great white shark expedition today. Farallons great white shark adventures are offered under the guidelines of a permit by the Gulf of the Farallones National Marine Sanctuary. The permit authorizes Incredible Adventures to use decoys to actively attract white sharks near its boat and shark cage. The decoys must be constructed of a soft material and shaped like a marine mammal native to the area. We try to limit our San Francisco Dive Adventures to adults only. Some exceptions are made for teenagers or dive certified youngsters with extensive experience on the water. The day at the Farallones is a long one and seas can be rough. A seasick or grumpy child would ruin the trip for everyone. Please understand if we tell you your 8 year old isn't welcome. No dive experience is necessary for those 18 and over. Our shark boats are staffed with certified dive instructors who oversee the safety of those in the shark cage. We use a hookah-style system. Air hoses extend down into the cage to allow for easy breathing. If you're a cage diver, you'll need to bring your own mask. It doesn't have to be an expensive item....just a mask that fits you and is suitable for snorkeling. We provide our cage divers with everything else they will need for their time in the cage, including a hooded wetsuit, gloves, booties and weight belt. We also have plenty of towels on board. If you plan to spend the day topside, remember to dress warmly. We recommend dressing yourself in layers, because it can be warm and sunny one minute and cold and foggy the next. We have some cameras and binoculars on the boat, but you may wish to bring your own. We provide plenty of food and beverages for the day. If you have a special request, don't hesitate to ask. We can't make any promises, but we'll do our best to accommodate you. Do Topsiders Have Fun Too? Definitely! We put our topside observers to work manning our seal decoys and watching the horizon for fins. 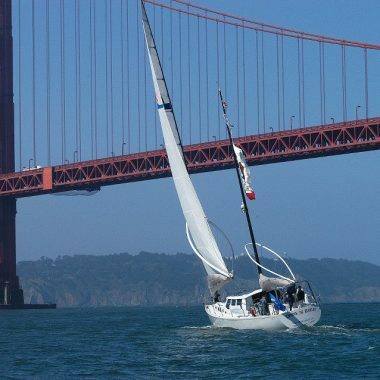 You'll hang out with our naturalists and deck staff, learning about white sharks and the Farallones and having an incredible time. Get ready to yell SHARK! !